In the early years of aviation, flying was truly dangerous. Even routine training carried significant risk. It was 1929 when we first started to see the use of simulation to gain experience without risking injury or death. The first real step taken toward what we would recognize as a simulator was the Link Trainer. This device allowed pilots to learn instrument skills without experiencing the risks that were involved in early IFR flying. From these beginnings, simulation has advanced to the truly amazing technology we see today. But the concept is constant: gain experience without the risk. In a nutshell, simulators allow us to practice dealing with dangerous or difficult situations without exposure to the risk that would normally accompany them. These include engine-out landings, partial panel in IMC, and critical malfunctions. In the real world, we have to place restrictions on these maneuvers to ensure safety. In the simulator, we don’t have to worry about that. Bungled that ILS? No problem. Just a few key strokes put you back at the Initial Approach Fix to try again. In real life, you would have to execute the missed approach and wait for ATC to work you back into the sequence. While there’s value in practicing such maneuvers, simulating the task can reduce the amount of time spent learning the basics. Psychologists have a term for these kinds of highly drilled tasks. “We call them ‘overlearned’ skills,” says Dr. Chris Front, an aerospace clinical psychologist with the FAA’s Office of Aerospace Medicine. “These tasks are practiced to the point of mastery. Overlearned skills tend to be maintained under stress because they have become automatic. So, overlearned skills reduce the mental workload during a high stress situation and improve the odds of successfully executing the correct procedures. That’s what makes the drilling of those tasks so useful as preparation for an actual emergency. Additionally, overlearned skills tend to be retained during the early stages of cognitive decline such as dementia,” Dr. Front explains. Fidelity is the term used to describe how close to real something is. In the case of flight simulation technology, there are different categories of fidelity to consider: physical, visual, and what we might call modeling. The physical fidelity has to do with how closely the actual device conforms to the aircraft. In a perfect world, the controls, switches, and layout would look and feel identical to the real world counterpart. The fidelity of the visuals is especially important, because vision is the most powerful sense and because it directly impacts how immersive the simulation will be. Modeling is a term that conveys how well the simulation handles the aircraft’s character in the virtual world, i.e., does it fly like the real aircraft? The combination of these factors lead to an overall level of fidelity, which basically dictates how “real” the experience is. Which level of fidelity works best for the task at hand? The snap answer is usually “well, the best one I can get my hands on.” But that’s not really the case. When I was working on my instrument rating, my flight school had two different Flight Training Devices which, in today’s definitions, would be called Advanced Aviation Training Devices (AATD). The school had an older one and a newer, “better” one. Without fail, all of us preferred the older one. In reality, though, the “better” one was pitchier than an early round American Idol contestant. As a result, the theoretically “better” equipment actually offered a worse training experience in terms of learning the basics of instrument procedures because it forced the student to spend too much mental energy trying to keep the aircraft under control, when that energy should have been directed to learning how to execute procedures. The bottom line is that what you need in terms of simulation fidelity depends mainly on the aeronautical skill you’re looking to sharpen. If the goal is to better understand your avionics so that you don’t get confused and distracted while reprogramming a route, then a simple software simulation of the avionics box is probably a good place to start. With this setup, you are both overlearning the desired skill and reducing the novelty of potential mistakes. Both reduce the mental processing required during any future encounter. Another good use for low fidelity is in learning basic procedures. When my father was working on his instrument rating in the early 90s, the instructor would bring this odd box to our house. It was essentially an instrument panel with a yoke and throttle controls that he set up on the dining room table. It doesn’t get much more low fidelity than looking over the glare shield into the china cabinet. But for learning basic procedures like setting radios, intercepting and tracking, holding, and following a generic approach, the simplicity is brilliant. It allows the student to focus on that task and master it before getting in the airplane. On the opposite end of the spectrum is the world of full motion simulators with stunning visuals. In the form used by the airlines, these things are so close to the real thing that we use them for certification. Although this type of device comes at a hefty cost, modern technology has helped lower the price of some high fidelity simulators to a point more feasible for GA. Still, they are expensive to buy and operate when compared to lower fidelity options. So assuming your time and money are limited, you probably won’t have — or need — unfettered access to this level of simulation. There are, however, cases — for example, high stress situational training — where immersion and realism matter. Shooting an approach to minimums in a heavy rain storm is beyond reckless, but I’m willing to bet more than a few pilots out there have made a series of unfortunate decisions and found themselves left with that being the best of bad options. I know I have. The experience sapped every bit of mental bandwidth I had. I remember the other pilot who was working the radios asking if I had seen something off the side of the runway after touchdown. I hadn’t. It’s a quirk of visual processing that as the brain overloads, you will literally not see things that your brain decides aren’t important. The best way to improve your performance in such a situation is to practice. In this type of high stress training scenario, higher fidelity is better. For most people, a middle ground level of fidelity is sufficient. The key is to figure out what tasks you want to work on. 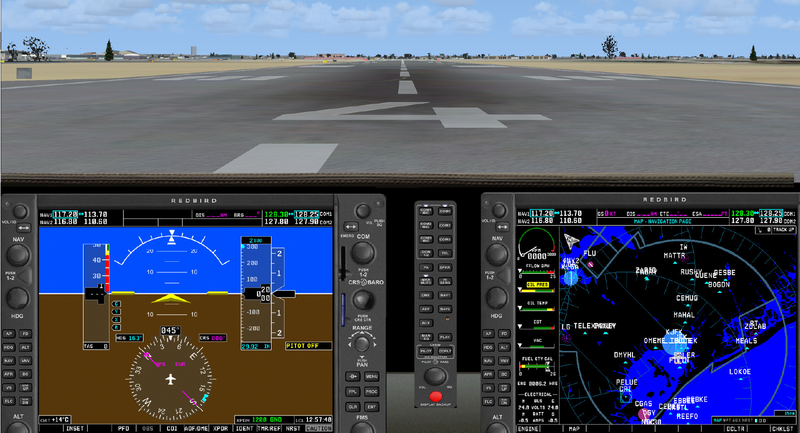 A good example of the middle ground is computer flight simulation for airport familiarization. During my training days, I would practice cross-country flights on my trusty copy of X-Plane (we were an X-Plane family, not a Microsoft Flight Simulator family). My clunky CRT monitor and joystick weren’t particularly good analogues for my Piper Cadet, but the fidelity was good enough for me to learn what the sight lines looked like as I approached the airports I’d never been to before. Given the advances since then in both computer graphics and mapping/imaging data, the benefit would be even better. The key in the middle ground would be to select the fidelity that best suits the task. For my familiarization flight mentioned above, visuals may be the most important. But for practicing instrument procedures, modeling is more important because you’ll want to have as close to a real reaction as possible. Besides, the gray inside of a cloud looks the same in sparkling 4K as it does in dull SVGA. If you want to practice emergency procedures, the physical elements are important so that you practice in a way that translates to your aircraft and with less concern about the modeling or visuals. There is no one right answer when it comes down to which method of flight simulation technology is optimal. It will always be an amalgam of what skill you are working on, whether you are training or testing, what options are available, and the opportunity cost of each option. Provided you’re able to access one, a full motion high fidelity sim might work really well. But one hour in that sim might cost the same as ten-plus hours in an AATD with an instructor. The AATD would probably be a better return on investment. Now that we know just how many options we have, we can look at how to best use them. This will be different for every pilot. A good place to start is with an instructor. Having an instructor put you through the paces in an AATD is a great way to figure out your baseline, and decide which tasks you should prioritize. Once you have that information, you can make a plan. You can set monthly goals. Maybe you need to work on your non-precision approaches (NPAs). Set a goal to do 50 NPAs this month on your computer at home when you have spare time. Next month pick a different task. Rotate through the things you need to improve. Then go back to your instructor six months or a year later and see how you’re doing. You can also do more specific work. Maybe a week before a planned trip you can “fly” to your destination virtually, practice any approaches you might encounter, and even vary the weather conditions. This activity gives you more experience, even if it’s in a virtual world. Both a continuous skill improvement plan and specific trip training are far more practical in the virtual world. You can fly to any airport in the world with a few mouse clicks in simulation. You can give yourself more training opportunities in less time, whether it’s at home, at a flight school, or in an AATD. You could easily do four or five approaches in simulation in the same time that it might take to do one or two in the real world. While real world experience is still the gold standard, simulation is a great tool to let you make the best of the time you do get to train in the real world. We all have limited time and money for training so it only makes sense that we should optimize it as much as possible to mitigate the risks of learning in Mother Nature’s less forgiving environment.